Introduced pest animals threaten our native wildlife. Introduced predators, such as foxes and cats, prey on our wildlife. Introduced herbivores compete with native animals for food and other resources. However it is not only our native animals that are disadvantaged by these pest species. Farmers are also affected by foxes that destroy livestock, and rabbits that cause erosion with their warrens and by eating crops. Under the Victorian Catchment and Land Protection Act 1994, landowners are responsible for controlling pest animals and penalties can be imposed if control works are not carried out. Animals that are classified as pests and must be controlled under the CaLP Act include foxes, rabbits, wild dogs, feral pigs and feral goats. There are a range of techniques available for controlling pest animals. However, not all of them will be suitable for your situation. Make sure you study your options carefully before deciding which is right for you. While it is easy to observe when rabbit population numbers are high as damage is noticeable, it can be hard to know when populations are building. To ensure rabbits have minimal impact within a specific area, population numbers should be monitored regularly. Then, when their numbers reach unacceptable levels, control actions should be undertaken immediately. If rabbit population numbers have reached levels which require control, an integrated approach using a range of techniques usually works best. This can includes measures such as fumigation, shooting, baiting using 1080, ferrets, warren ripping and netting. Most of these techniques listed above require specialist practitioners with appropriate licences and accreditation, with their associated equipment and other costs. 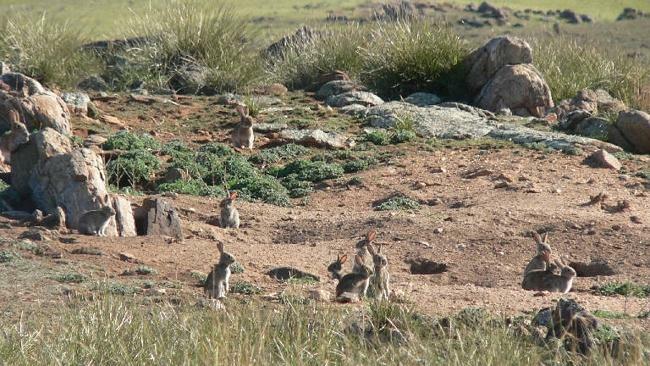 We have found that a useful approach for landholders to get started with rabbit control themselves in a cost-effective manner is to establish one or more rabbit bait stations. An oat bait – with pindone as the active ingredient – is used within the bait stations. A rural supply merchant can be contacted for the product and advice. However, as noted above, the most effective rabbit control uses a range of techniques – and constant vigilance. The good news is that even the most rabbit-infested properties can be brought under control, and the rabbit numbers maintained at very low to negligible levels. Feral Scan: Website and database containing information on vertebrate pest animal species in Australia. Includes the FeralScan Pest Mapping tool, used to map pest animals and note the damage they cause in their local area. Field Guide to Pest Animals of Australia: Species profiles for 53 of Australia’s worst pest animals including control techniques. Download the App from the Apple Store. Invasive animal management: Information from Agriculture Victoria.